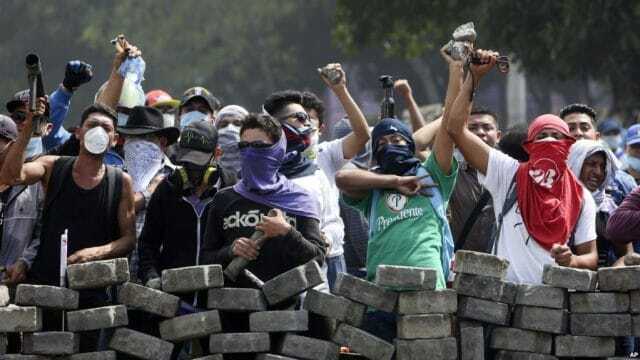 MR Online | Correcting the record: what is really happening in Nicaragua? Posted Jul 23, 2018 by Eds. Sandinistas and followers of President Daniel Ortega wave their Sandinista flags in a massive peace march that was held on July 8, 2018, in Managua. Source UK Morning Star. This article seeks to correct the record, describe what is happening in Nicaragua and why. As we write this, the coup seems to be failing, people have rallied for peace (as this massive march for peace held Saturday, July 7 showed) and the truth is coming out (e.g., the weapons cache discovered in a Catholic Church on July 9th). It is important to understand what is occurring because Nicaragua’s is an example of the types of violent coups the U.S. and the wealthy use to put in place business dominated, neoliberal governments. If people understand these tactics, they will become less effective. 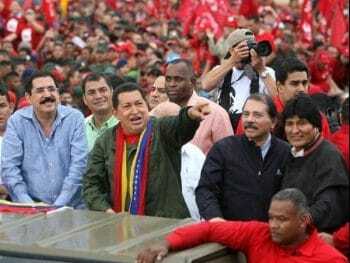 A common claim is Ortega has cozied up to the traditional oligarchy, but the opposite is true. 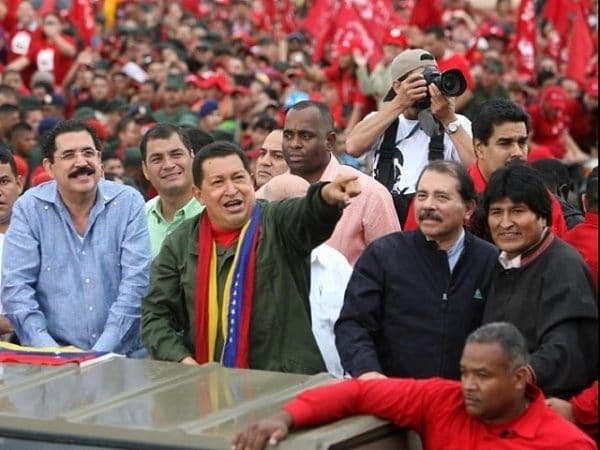 This is the first government since Nicaraguan independence that does not include the oligarchy. Since the 1830s through the 1990s, all Nicaraguan governments–even during the Sandinista Revolution– included people from the elite “last names,” of Chamorro, Cardenal, Belli, Pellas, Lacayo, Montealegre, Gurdián. The government since 2007 does not, which is why these families are supporting the coup. As such, workers and peasants–many of whom are self-employed and who accessed productive capital through the Sandinista Revolution and ensuing struggles–represent an important political subject of the stable, postwar social development of the last decade, including the hundreds of thousands of peasant farmers who have received land title and the nearly one-quarter of the national territory that has been given collective title as territory of indigenous nations. The social movements of workers, peasants, and indigenous groups were the base of popular support that brought the FSLN back into power. The National Dialogue shows the class interests in conflict. The opposition’s Civic Alliance for Justice and Democracy has as its key figures: José Adan Aguirre, leader of the private business lobby; Maria Nelly Rivas, director of Cargill in Nicaragua and head of the U.S.-Nicaragua Chamber of Commerce; the private university students of the April 19th Movement; Michael Healy, manager of a Colombian sugar corporation and head of the agribusiness lobby; Juan Sebastian Chamorro, who represents the oligarchy dressed as civil society; Carlos Tunnermann, 85-year-old ex-Sandinista minister and ex-chancellor of the National University; Azalea Solis, head of a U.S. government-funded feminist organization; and Medardo Mairena, a “peasant leader” funded by the U.S. government, who lived 17 years in Costa Rica before being deported in 2017 for human trafficking. Tunnermann, Solis and the April 19th students are all associated with the Movement for Renovation of Sandinismo (MRS), a tiny Sandinista offshoot party that nonetheless merits special attention. The result of this consistent building and funding of opposition resources has been to create an echo chamber that is amplified by commentators in the international media–most of whom have no presence in Nicaragua and rely on these secondary sources. Remarkably, Maradiaga is not the only leader of the coup attempt who is part of the Aspen World Leadership Network. Maria Nelly Rivas, director in Nicaragua of U.S. corporate giant Cargill, is one of the main spokespersons for the opposition Civic Alliance. Rivas, who currently also heads the US-Nicaragua Chamber of Commerce, is being groomed as a possible presidential candidate in the next elections. Beneath these U.S.-groomed leaders, there is a network of over 2,000 young people who have received training with NED funds on topics such as social media skills for democracy defense. This battalion of social media warriors was able to immediately shape and control public opinion in Facebook in the five days from April 18th to 22nd, leading to spontaneous violent protests across the country. There have been four major opposition rallies since April, directed toward mobilizing the upper-middle class Nicaraguans who live in the suburbs between Managua and Masaya. These rallies featured a whos-who of high society, including beauty queens, business owners, and oligarchs, as well as university students of the April 19thMovement, the moral high-ground for the opposition. Three months into the conflict, none of the mortal victims have been bourgeois. All have come from the popular classes of Nicaragua. Despite claims of total repression, the bourgeois feels perfectly safe to participate in public protests by day—although the last daytime rally ended in a chaotic attack by protesters against squatters on a property of, curiously enough, Piero Coen, Nicaragua’s richest man. The nighttime armed attacks have generally been carried out by people who come from poor neighborhoods, many of whom are paid two to four times the minimum daily wage for each night of destruction. The U.S. Executive Branch has used the Global Magnitsky Act to target the finances of leaders of the Electoral Supreme Court, the National Police, the city government of Managua and the ALBA corporation in Nicaragua. Police officers and public health bureaucrats have been told their U.S. visas have been revoked. 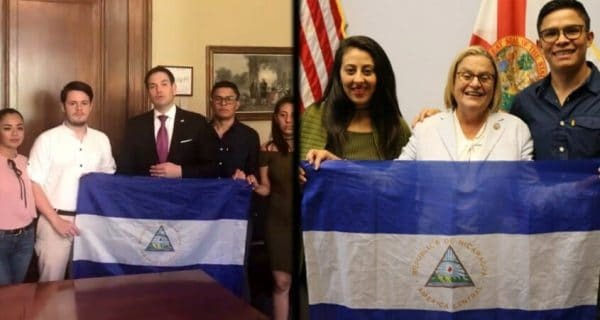 The point, of course, is not whether these officials have or have not committed acts that merit their reprimand in Nicaragua, but whether the U.S. government should have the jurisdiction to intimidate and corner public officials of Nicaragua. Kevin Zeese is an attorney who co-directs the U.S.-based Popular Resistance. Nils McCune is on the Technical team of IALA Mesoamerica (Agroecological Institute of Latin America in Nicaragua) and a research fellow at the University of Michigan.